Thanks to Monsanto, most of the corn grown in the US – up to 95% of it – is genetically modified (GMO). 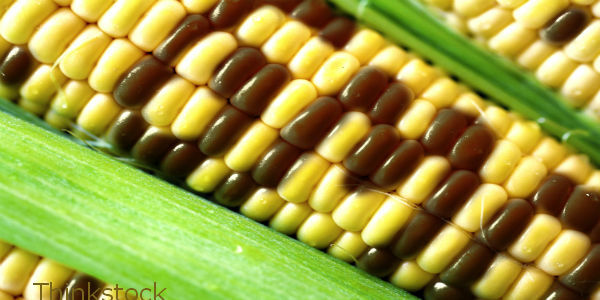 Even worse, some major supplement producers are hiding that GMO corn in vitamins! Corn is not just used as a filler in dietary supplements, it can be the main source from which Vitamin C, for example, is derived. And of course corn is not the only GMO ingredient used. Rice, soy and sugar are other common GMO ingredients. Although some producers now note which, if any, of their supplements are made without GMOs, there’s no clear standard in labeling to certify that those products are truly GMO-free. Some use “GMO-free,“ while others label these products as organic or non-GMO, but those that say nothing about GMO, are likely full of it. Consumers have a right to know what’s in their vitamins so they can put pressure on all supplement producers go 100% GMO-free. Genetically modified foods do NOT belong in our vitamins! Tell top makers of dietary supplements (or the one that makes yours) to disclose all GMOs (including genetically-derived ingredients) in their products. Many people use supplements to heal and/or to make up for the poor nutritional content of modern foods, due not only to GMOs, but also nutrient-depleted soil, pesticide residues and other factors adversely affecting the quality of today’s foods vs. those eaten by our ancestors. Therefore it is absolutely essential that supplements are free of poisons that compromise modern soil and foods. This trend has to change, and it must begin with consumers demanding that dietary supplement manufacturers disclose all GMOs (including all genetically-derived ingredients) used in their products. This petition targets all manufacturers of dietary supplements. But of particular concern are those that are linked with or part of the biotech/GMO industry like Bayer, which also makes pesticides and children’s (Flintstones) vitamins, and Proctor and Gamble (New Chapter), who is now linked to Monsanto. We begin this petition with our letter to these and the makers of three other widely available brands: Pharmavite (Nature Made), Pfizer (Centrum), and IdeaSphere (TwinLab). Pfizer and Proctor and Gamble are also linked to the former American Cyanamid Company, a leading producer of agricultural and many other toxic chemicals. The above was taken from another site since I cannot host Java on this Blog. Please properly read what you are signing and unclick any boxes to prevent unwanted e-mail.